This case study shows how the civil society organisation CAPA in southern Brazil supports family farmers to switch from tobacco growing to organic food farming. 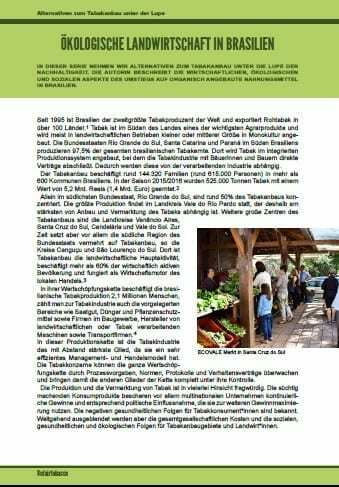 The author visited the Centro de Apoio e Promoção da Agroecologia (CAPA) in Santa Cruz do Sul and got an insight. Which offers does CAPA use to empower farmers to start organic farming? What are the changes the farming families face in the transition? How are the fruits and vegetables processed and marketed? Switching to organic farming of fruits and vegetables provides very good opportunities for smallholder farmers in southern Brazil.